If one takes the life of a mate, then their mate shall be taken as retribution. Such are the laws of Jötunheim, the laws that Sigyn faces when she follows her beloved and his friends into the realm of the Frost Giants, and Theoric's blade takes the life of the Jötunn Queen. But rather than claim her head, Laufey passes jurisdiction to his eldest son, who claims Sigyn's hand instead. Out of love and fear for Theoric, she accepts. Loki finds himself quickly enamored of his new mate, but he has always been one for tricks and mischief, as well as a man with ambition. And that all may cost him dear. "The marriage of Sigyn and Loki is a mystery waiting to be revealed." So says the entry on the official Marvel site. Well, wait no longer. Set between the events of The Dark World and Ragnarok, this is my version of the courtship of the God of Mischief and the Goddess of Fidelity. Painstakingly MCU compliant. Update: For Sigyn and Loki's first fight as newlyweds, see Liberty and Virtue. Thank you so much for reading and leaving comments and kudos. I consider this fic my magnum opus for the time being and am very proud of the fact that I actually finished it and broke 50k words doing so. I am nowhere near done with this pairing, so don't worry, I will be writing more Logyn soon! Want more Logyn goodness? Listen to the Spotify playlist of the songs that inspired my chapter titles! This one-shot fits into the continuity of my Devil or Angel series, but it can be read as a stand alone. 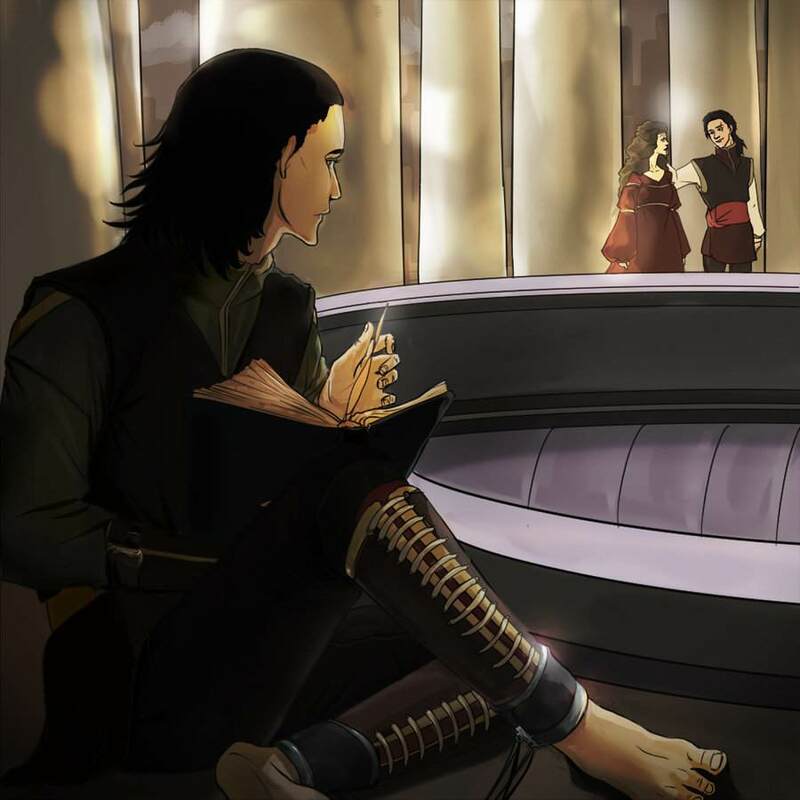 Set during Loki's imprisonment in the Asgardian dungeon in The Dark World and inspired by this lovely piece of fanart, it is also my entry for the August AO3 Facebook Challenge to write a fic based on/inspired by any picture of your choice. im not sorry...or am i? Loki has fallen in love, he has never wanted someone as much as he wants Sigyn from Vanaheim. And she wants him, can you believe that? But there is a problem, Sigyn is to be married off per her mothers doing. But these two will stop at nothing if it means they can hold one another, and in the end, they will. In which Loki hatches a plan more permanent than death to win his lady love from her betrothed, and it - doesn't quite go to plan. "When he goes to Thanos, he will die." Sigyn has always heard the voices of fate,they gave her one prophecy that truly scared her. No matter what she did, she knew she couldn't stop it. But oh how she wish she could. Sigyn is in a new relationship and Loki isn't thrilled. Plus, Thor loses his hammer and it takes a whole wedding party to get it back. Five months before Loki’s trial, Sigyn, a young academic, receives a request from Frigga to assess her son’s mental health. She agrees, but when Amora gets involved with a plot to help Loki escape, Sigyn develops some serious doubts about her future – and about Loki’s. Little is written of Sigyn in the myths, but she is nonetheless adored as the faithful wife of Loki. They had been a couple when they visited earth long ago, but that is the past. Now she is engaged to Theoric their wedding is on the way, but as the day draws near she fears her marriage will not be without mischief. Sigyn is betrothed to Theoric but she does not love him. She and Loki have been friends since childhood, but since her return from Vanaheim, it seems their friendship is evolving into something more. Set in the MCU before the events of the first Thor movie. This story is mostly fluff. I needed a feel good Loki/Sigyn story in my life when I wrote this. Marvel Universe meets High-School AU. As Sigyn's marriage to Theoric looms she can't shake the feeling that something - someone - is watching her. Spitsbergen, 1879. A rip between the realms has been discovered, sparking the curiosity of the world. Explorers hunt on the other sides, finding creatures to bring back and place on display, advertising them as the exotic. London, 1880. Sigyn Rosettia has been engaged to the wealthy Lord Theoric Faulkner in a desperate bid to save her family from financial collapse. On an outing to one of London’s latest freakshows, she there encounters a monster distressingly, confusingly, and achingly familiar. Isso aconteceu há muito tempo, quando Sigyn descobriu-se apaixonada por Loki e esse amor durou toda sua vida. So this is based on the prompt “I’m sorry that I got way too into playing house and accidentally kissed you passionately.” And, no, Loki does not say these words but... I think this turned out all right? AU where instead of Laufey insisting on a fight, Odin and Laufey go to talk about a truce for their realms and Laufey’s counsel consists of Býleistr and Helblindi and Odin’s counsel is Loki and Frigga and while Býleistr is wandering the palace, he sees Sigyn and Theoric who are talking about their engagement and Býleistr decides that he wants the little blonde who talks to her betrothed as though he is a friend and eyes the stolen Jotar prince with secret desire because he wants to cause trouble and so he convinces Laufey that the way to make peace is to wed a Jotar and a Asgard and Býleistr, being the eldest son would take the duty. And since the All-Father has no daughters of his own, why not the girl they care for, the Lady Sigyn? And Sigyn agrees because she can’t say deny the All-Father but Theoric is ready to kill Býleistr and Loki’s just furious and so angry with his true brother and Býleistr‘s just enjoying the way that Loki is trying to hide his feelings for Sigyn and Sigyn’s hiding her feelings for Loki because she has to, she’s married to his brother and… So much angst and feels and fluff and Býleistr being a cocky dickhead and… Yas. "You call faithful being with another woman while your wife is nowhere in sight?" Thor interrupted him. "If your lover was here, she would kill you in an instant." Prince Loki and Princess Sigyn's destinies are tied together in a way the young royals cannot begin to comprehend. Yet the bitterness of war runs strong in Sigyn's veins, keeping them apart. When death comes to Asgard, Sigyn is taken further away from Loki than she has ever been, leaving behind her home and loved ones. When Sigyn and Loki realise that not everything is as it seems, what lengths will they be willing to go to be together again?